As of this writing on April 5, 2012, warm air temperatures and reductions in snow albedo caused by merged dust layers D6/D5/D4 have, together, initiated accelerating rates of snowmelt and SWE loss at some, but not all, CODOS Snotel sites. Between March 26 and April 2 the Swamp Angel Study Plot at Senator Beck Basin lost 4.6” SWE (117 mm) and 14” (35 cm) in snowpack depth. Some CODOS Snotel sites report significant declines in SWE to levels approaching the lowest values in the period of record (for a given date) or even falling outside of the historic range. Those sites may have, then, already experienced Peak SWE for WY 2012. In contrast, even with reductions in snow albedo comparable to those at Swamp Angel Study Plot, between March 16 and April 4 our Grand Mesa Study Plot lost almost no SWE (0.15”) even while the snowpack lost 9” in depth. The nearby Mesa Lakes Snotel also recorded virtually no net loss of SWE since our March 16 site visit, while losing 10” of depth. At Grand Mesa, and other locales exhibiting this static SWE, another significant storm in coming days could produce this season’s Peak SWE value at/near the normal date for Peak SWE, albeit at well below average levels. At those sites where snowmelt has been slow to accelerate, solar energy absorbed by dust at the snowpack surface, and transmitted into the snowpack as melt energy contained in percolating free water, may have been consumed in warming the snowpack to 0° C throughout (isothermal). Event D7, and the potential for additional dry dust deposition later today (April 5), will further enhance direct absorption of radiation during the generally dry and warm weather expected to continue through April 10-12. Our snow profile on April 4 found virtually no net loss of SWE since the March 16 profile, but did show settlement and densification of the snowpack. This evolution is replicated in the Mesa Lakes Snotel data for the period, also showing very little loss in SWE but considerable loss of snowpack depth. Aside from the temporarily re-frozen, laminated ice layers in the top 10 inches, the April 4 profile presented wetter snow than was observed in the March 16 profile, and snow temperatures within the April 4 snowpit were fully isothermal (aside from the refrozen near surface snow, which was likely to fully thaw later that day). 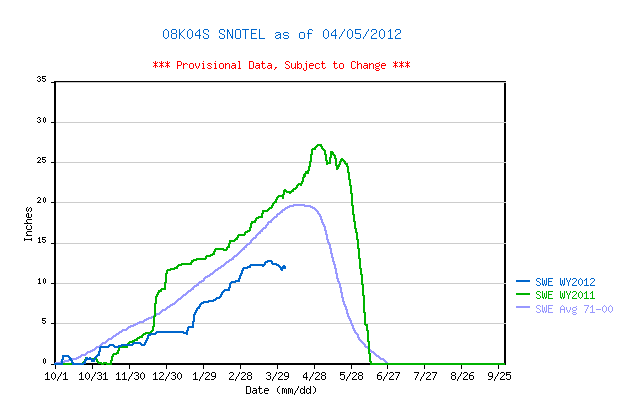 A small amount of cold content was measured in the snowpack in our March 16 snowpit. The April 1st dust layer D7 was very evident on the Grand Mesa during our April 4 site visit, captured within and sitting underneath an inch or two of new snow that fell with the dust. That dust fell onto the merged D6/D5/D4 dust at the snowpack surface. During our visit, the new snow above and containing D7 dust (photo) was visibly melting and merging with that underlying dust. Despite reduced snow albedo values often in the 60% range (dust-free spring snow values can be near 80%), and warm temperatures, almost no net loss of SWE was reported at the Mesa Lakes Snotel in the past three weeks. Very small losses in SWE during that period were offset by a gain of about 0.5” SWE on March 18/19 during the storm that delivered D5. SWE measured in our snow profiles at our Grand Mesa Study Plot also showed virtually no net loss, at 20.0” (509 mm) on March 16 compared to 19.85” (504 mm) on April 4. Apparently, melt energy produced by dust-enhanced melt at the snowpack surface during this period was largely consumed, at these elevations, in finally warming the snowpack to 0° C (isothermal) throughout. 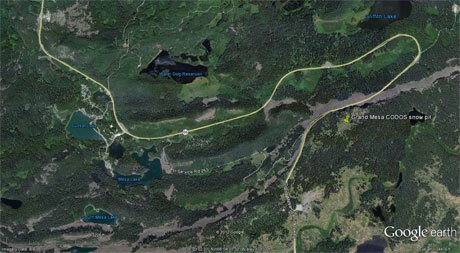 Observation of lower elevation snowcover extent on the flanks of Grand Mesa do, however, reveal substantial loss of snowpack there, as reflected in recent streamflow data. As a result of this static level in SWE, it remains possible for this season’s Peak SWE to still occur at the Mesa Lakes Snotel site at or near the 30-year average date, given a significant storm. Increased flows on Plateau Creek following the decline during and just after the March 18/19 snowfall include the influence of D5 and D6 reductions in albedo, and of the very warm weather, particularly on the lowest elevation snowcover. The minor snowfall that delivered D7 and a cool-down on April 1 produced another decline in runoff rates, and the incremental reduction in albedo produced by D7 was underway during our site visit on April 4, and will begin to be reflected in streamflow today, April 5, as that layer becomes fully emergent (and merges with D6/D5/D4) and temperatures rebound. Strong SW’ly winds in southeast and eastern Utah, northeastern Arizona, and western Colorado, pose a risk for another dry dust storm today and tonight, April 5, with very low chances of accompanying snowfall but with some cooling in air temperatures Friday. Beginning Saturday high pressure will rebuild over western Colorado bringing dry and warmer weather through mid-week, although some models present a small chance of Gulf of Mexico moisture reaching the San Juan Mountains Tuesday through Thursday (April 10-12).